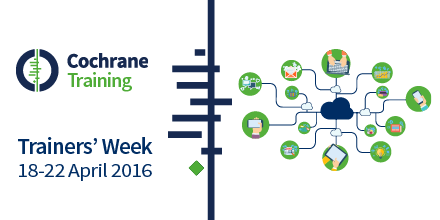 Trainers’ Week opened with introductory Meet the Trainers sessions, hosted by Cochrane's Learning and Support Department. These sessions were an opportunity for us to introduce the week and explain our plans to continue to support and develop Cochrane’s Trainers’ Network. They were also a chance for Trainers' Network members to introduce themselves through our virtual noticeboard, share training activities in their local or regional settings, as well as share their own ideas and thoughts as to how the Trainers' Network might continue to support you in your training for Cochrane. Thank you to everyone who took part in these sessions and made them so friendly and informative. The virtual noticeboard will be available throughout the remainer of Trainers' Week and beyond, so do stop by and post something about yourself and your activities if you have not already had chance to do so. You might also want to check the virual noticeboard for opportunities to make contact with other Trainers' Network colleagues. Go to the virtual noticeboard here [or watch a brief video about how to use it]. Ms Teachina Superbio is our own resident super-trainer! And a place for us all to pose our 'wish list' of training and teaching needs. You can see what others have posted and add some thoughts yourself about what would really help you in your work as trainers - go here to get access to Ms Teachina. PowerPoint slides [PDF] from the Meet the Trainers sessions.